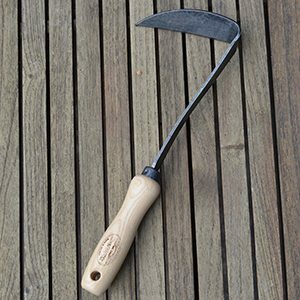 The Japanese Razor Hoe is the Nejiri Gama Hoe, and it is one of the most useful small gardening tools you can buy. It is great for weeding, especially in confined spaces such as between plants, in raised veggie gardens or containers. It can also be used to cultivate small areas. 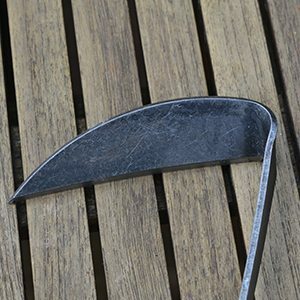 You can also use this as a planting tool, great for planting smaller perennials and veggies. You can find these in both left and right handed versions, and it does make it easier use. What to look for in a Japanese Hoe. Look for quality when buying a Japanese hoe, you want a hand forged hoe made from a single piece of Boron Steel, which is a ‘super hard’ steel. You also want a strong single piece wooden handle (Hardwood not Pine or other softwood). You will know when you pick it up by the feel and the weight. Use a sharpening stone to keep the cutting edge ‘razor sharp’, use a little linseed oil to keep the blade clean and rust free. Sand lightly one a year with a light sandpaper. And then oil the handle. You can use a rag to apply the oil, and then rub it in. The favourite oils are linseed oil and tung oil. The Linseed oil is mixed 50/50 with mineral turpentine, and boiled linseed oil is even better, if you can actually find it. You do need to let the oil dry, and this can take a week or two.